A truck has rolled on the Bruce Highway at Coochin Creek causing major traffic delays for motorists. A TRUCKIE is lucky to be alive after rolling his vehicle on the Bruce Highway at Coochin Creek this afternoon, blocking lanes and causing major traffic delays. 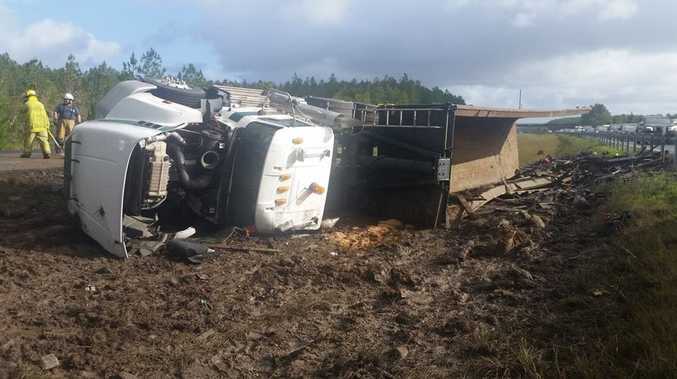 The semi-trailer reportedly was travelling in the northbound lanes but ended up crashing through the safety barriers, coming to rest on its side in the median strip. Queensland Traffic reports soutbound lanes are closed towards Caboolture due to the rollover at 2.55pm. Multiple emergency services in attendance. The crash occurred just before the twin Shell Service Stations, which is affecting lanes towards the Sunshine Coast as well. Queensland Ambulance Service are on scene and treating a man in his 50s. The man is believed to be out of the vehicle and is being transported to Sunshine Coast University Hospital in a stable condition. Two Queensland Fire and Emergency crews were required to deal with diesel fuel leaking from the crash. It was cleaned up within 10 minutes of their arrival. Delays are expected and motorists are urged to proceed with caution.